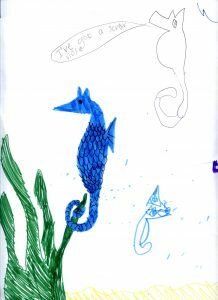 Here at the trust we are always pleased to receive feedback from seahorse fans from all around the world and this morning we received this amazing picture by 7 year old Maria from Glasgow, Scotland. As well as this colourful picture of seahorses we also received a seahorse shaped notebook handmade by Maria and she has kindly saved up her birthday money and sent us £10 towards our work. Without the amazing support by seahorse fans like Maria we could not do our work and we would like to thank her for thinking of the seahorses when she got her birthday money. We will make sure her money will go towards the work we do in conserving British seahorses, which are also found around Scotland. Earlier this year both types of seahorse, the Spiny and the Short Snouted were protected in Scotland which the trust helped to put into place. Thank you Maria for your amazing support.